If anything has been amplified to a painful level this year, it is the consequence of political dysfunction, and how the failures to govern by Congress, the Administration and both political parties have negatively affected the United States, both at home and abroad. No sector of society has been spared the impact of this colossal failure of the two-party system, and certainly we’ve felt it in the space community—both in the U.S. and more broadly around the world. When one thinks of the North Pole, it’s probably not about how our military forces communicate in that frigid region of the world. Thankfully, there are plenty of people that do think about these challenges every day and they work on a program called EPS. 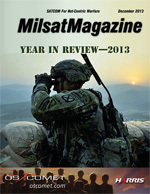 Maintaining + Taking Space Situational Awareness To The Next Level, By Colonel Mark A. Baird, U.S.A.F. Without question, the United States has become increasingly reliant on space. Both economically and militarily, our dependence on space assets is undeniable. Orbiting satellites provide myriad services that we have become dependent on, such as precise position, navigation, and timing (PNT); communications; weather data; missile warning; and intelligence, surveillance, and reconnaissance (ISR).